Jacob Beck was born May 10, 1816 in Weiler, Baden, Germany son of Frederick Beck. His father brought the family to Buffalo about 1825. When about 12 years old began a seven year apprenticeship with a doctor in Troy, New York. In 1835 he followed his family to Doon and in 1839 moved to Preston. He developed a type of water wheel, also an iron works at the foot of Shantz Hill. He later moved to Baden, Ontario producing stoves and furnaces also was the postmaster there. An enterprising young German came here [Preston] about 1838 by name of Mr. Jacob Beck. He had invented a peculiar kind of waterwheel, small in size but of great power, and its use in several small water powers gave young Mr. Beck quite a reputation. He commenced a small foundry near a saw-mill in the village of New Hope, and finding considerable encouragement came to Preston, where he erected a foundry upon the premises now owned by Peter E. Shantz in Fountain Street. Business increased rapidly, but unfortunately a fire broke out which completely destroyed his flourishing foundry and Mr. Beck, no insurance having been effected, stood once more poor and penniless; but, thanks to the liberality of his neighbors in and around Preston, a subscription was raised, men turned out to help with work and material and in a short time after the fire, Mr. Beck was again in possession of a foundry of considerably larger dimensions than the one destroyed by fire. He did an excellent business, and had men selling his stoves and other wares over a large part of Western Ontario. His means increased at a rapid rate, and he enlarged his premises according to the wants of his business. Some years later he took in as partners two of the young men in his employ, viz: John Clare and Valentine Wahn, and the foundry business continued to prosper for several years. Mr. Beck had in the meantime arranged with Mr. Robert Hunt of the Woolen Mills to improve his water power by heightening the dam and digging a canal from the dam alongside the (Speed River. This canal is still in existence except a small portion of its terminus which has recently been closed. Mr. Beck for the construction of the said canal obtained the privilege of erecting a saw-mill upon Mr. Hunt's premises. This saw-mill Mr. Beck carried on for some time but seeing that a grand scheme that he had in mind could not be carried out, he sold his sawmill to Messrs. Hunt & Elliott. This grand scheme was nothing less than extending the said canal, crossing King Street and Queen Street and erecting along the canal a number of factories and mills. The proprietor of the land positively refused to grant permission to construct such a canal and Mr. Beck was forced to abandon his cherished plan of making Preston a great manufacturing place, such as the Town of Galt is at the present day. Mr. Beck, notwithstanding the good business done in his foundry, became displeased with Preston. The partnership of Beck, Clare & Wahn was abruptly dissolved, the business closed and the affairs of the firm wound up. Each partner obtained his proper share of the assets, which were largely in excess of the liabilities, Mr. Clare a store and other property and Jacob Beck a large sum of money. He went in search of a mill property which he found in Wilmot. There he erected mills, foundry and other industries, and founded a village which he named Baden. The grist-mill built by him was the third grist-mill built with money earned in Preston. A master mechanical genius, Jacob Beck, born in Baden, Germany, came to Waterloo Township in 1837. He opened a smelting furnace at New Hope (Hespeler), and later established an iron works on Spring Creek, Preston. He invented a turbine water wheel and in partnership with John Clare and Valentine Wahn manufactured stoves at Preston. In 1854 Beck located a good source of water power on Spring Creek in Wilmot Township and purchased 200 acres. He erected a gristmill and foundry. He subdivided his farm in 1856, sold lots and developed Baden. Beck was a member of the first board for the 1839 school in Preston, village councillor, councillor Wilmot Township from 1860 to 1864 and Baden postmaster from 1854 to1879. In 1863 he gave the community the deed for land with the courthouse on it for one dollar. This building served as Wilmot Township Hall until 1867 and is now at Black Creek Pioneer Village, Toronto. Jacob Beck (born Grand Duchy of Baden, 1816), an enterprising young German, came to Waterloo Township in 1837 from Schenectady, N. Y., having come from Germany the year before. He had invented a peculiar water wheel, described as of small size and large power, which soon gave him an enviable reputation. Starting a small foundry in the Village of New Hope he soon transferred to Preston and built a foundry on the premises later owned by Peter E. Shantz, where he did a rapidly increasing business. Unfortunately, a fire completely destroyed his foundry and rendered the proprietor penniless, as he had no insurance. Thanks to the liberality of neighbors a sufficient sum was raised by subscription to enable Mr. Beck to start anew and to have a larger plant than that destroyed by the fire. He soon had a large staff selling his stoves, etc., in Western Canada. With increasing success he enlarged his premises and took into partnership two of his assistants, John Clare and Valentine Wahn. For improving the water power of Robert Hunt, proprietor of the woolen mills in the village, Mr. Beck obtained the privilege to build a saw mill on Hunt's property, which he carried on for some time. Beck evolved a project for a water power canal leading from the Speed River dam and supplying power to mills and factories along it, such was the confidence in those days in the plentiful flow of the river. The scheme for the power canal did not find support. Beck became displeased with Preston, dissolved partnership with Clare and Wahn, Wahn continuing the foundry. He located a good water supply in Wilmot Township, at a place he called Baden, where, beginning in 1856, he soon established a foundry and a grist mill and did a flourishing business. Lovell's Canada Directory of 1857 gives Beck as postmaster at Baden, miller, founder and machinist. Mr. Beck died in 1906. One of his sons is the Hon. Adam Beck, Chairman 'Hydro-Electric Power Commission of Ontario, born in Baden, 1857. A Mechanic named Jacob Beck (Father of Sir Adam) who was married to Jacob Hespeler's sister had invented a waterwheel of revolutionary design, entirely different from the ones then commonly in use which had the merit of developing more power from less flow and head than the ordinary type. He found his new wheel was getting considerable public acceptance and he was looking for a place to make it himself instead of having them made for him by others. In some way he and Bergey got together and Bergey built this foundry (It may have been built earlier) and rented it to Beck. Historians of the past say that Beck went from New Hope to Preston which statement I hesitate to question. However, one day when Mr. George A. Clare and I were driving along one of the Waterloo Township roads near Strasburg he stopped and tied the horse to a telegraph pole while he and I walked down through a field to the ruins of the old building, where he told me his father first worked when he came to Canada. While on the spot, Mr. Clare told me how his father, John Clare, happened to come here. It seems that Mr. Beck was making plough shares in his moulding shop and they were not coming out very good and the farmers who bought them were complaining; More or less in desperation, Mr. Beck went to Buffalo and there called on a friend, a Mr. Jewett, I believe, who ran a foundry. He told him his trouble and asked for the loan of a moulder who could make good shares and plow points, for three or four months, till he could get a stock made up ahead. The Buffalo friend recommended a young German named John Clare who accompanied Mr. Beck back to Canada and he was able to turn out articles that suited the farmers. Beck, I think, probably went from New Hope to Strasburg (or nearby Aberdeen) and from there later to Preston. My reasoning is that had he gone first to Preston and later to Strasburg, the Clare Bros. Plant would have been at Strasburg instead of at Preston. At the expiration of the arranged period, when there was a big enough pile of shares and points made up ahead, Mr. Clare did not return to Buffalo as originally intended; and for a very good reason. He had fallen in love with a daughter of Mr. Beck and in due course led her to the Altar; and they remained in Preston. That is the story Mr. George A. Clare told me that day. I have since learned that Mr. John Clare came to this country in 1844 and married Miss Beck in 1845. Mr. Jacob Beck who died in Detroit Iast week after a long and honorable life, was for nearly two generations the mainstay of the village of Baden, in this county, where he conducted a foundry and milling business. He was born in Germany about 92 years ago. When twelve years of age his family removed to the United Stated. At twenty Mr. Beck went to Preston and engaged in the stove and foundry business. 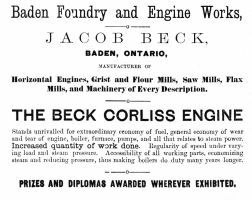 Twenty-five years later Mr. Beck founded the present town of Baden, Ont., where he went into the milling business. Under the administration of Sir John A. McDonald, Mr. Beck was entrusted with many Important political issues. He went to Detroit in 1877, still following the milling business. He was successful and became rich. He retired from active business only six years ago. Of his children, Hon. Adam Beck, of London, a member of the Ontario Cabinet, is one; Jacob L. lives in London: Charles in Buffalo; George has been his father's business partner; and a daughter is the wife of Rev. Dickie, pastor in the American Church in Berlin, Germany. Interment was at Preston, where his wife is buried. [S7] News - ON, Waterloo, Kitchener - Berliner Journal (1859-1917), 1 Jul 1875. 23 Jun 1875 In Baden, by Rev. A. Topp, D.D., of Toronto, assisted by Rev. J. Gounlay of Port Elgin, J.F. Dickie, Pastor of St. Andrews Church in Berlin, was married to Louise, daughter of Jakob Beck, Esq. of Baden. [S270] Census - ON, Waterloo, Preston - 1852, Pg 22. [S190] Census - ON, Waterloo, Wilmot - 1871, Div. 3 Page 39. [S1114] Book - Cambridge Mosaic, An Inquiry into Who's Who in the History of Cambridge. [Front] In loving memory of/ William BECK/ born May 9, 1851 - died Jan. 18, 1898/ Louise DICKIE nee BECK/ 4 Dec. 1847 - 6 July 1927/ wife of Rev. Dr. J. F. DICKIE/ In Jesu Christo Obdormivit/ [Flat marker] W.B. [Back] Geliebt beweint und unvergessen/ ruht hier in Gott/ Charlotte Josephine BECK/ geb. Hespeler/ 6 Mai 1822 - 26 Juni 1895/ und/ Jacob Friedrich BECK/ Weiler Baden, 10 Mai 1816/ Detroit, Mich. 21 Marz 1906/ BECK/ [Left side] Jacob F. BECK/ 1861 - 1928/ [Footstones] J.F.B./ C.J.B. [S2639] aaaWilmot Township 1861, Sect. 12 Page 76. [S13] Vit - - ON, Waterloo - Wellington District Marriage Register Part 1 1840-1852, Marriages By Rev’d Jacob Huttner, Lutheran Minister, Preston #53. [S20] News - ON, Waterloo, Kitchener - Berlin Telegraph (title varies: Berlin Telegraph, Berlin Daily Telegraph) (1853-1922), 7 Jun 1861. Beck: At Baden, on the 18th ult., the wife of Jacob Beck, Esq., of a son. [S7] News - ON, Waterloo, Kitchener - Berliner Journal (1859-1917), 26 May 1870. Barbara Beck died 1 May 1870 in Preston, widow of Friedrich, mother-in-law of John Clare, Preston, mother of Jakob in Baden and John in Preston. 78 yrs, 6 mths, 21 days. [S826] Church Records - ON, Waterloo, Preston - Saint Peter's Lutheran - index.